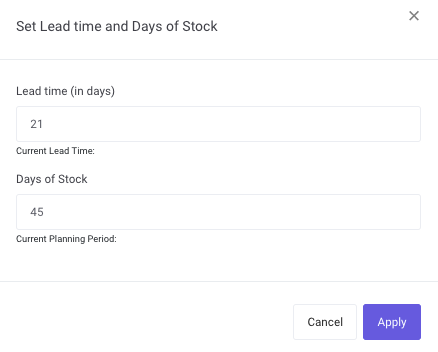 How can I set the lead time and days of stock? In order to product accurate replenishment recommendations, you will need to set the lead time and days of stock for your products. The lead time is the amount of time that elapses between placing a purchase order and receiving products. Days of stock is a period of time for which you’d like to have enough stock, or, in other words, the stock cover. Read more about how to choose the lead time and days of stock. In the Vendor section (from the left side menu), select a vendor by clicking on the name of the vendor. 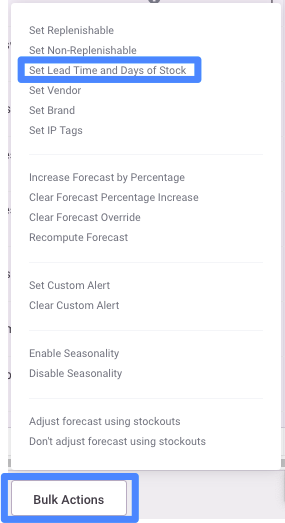 In the Vendor Settings, change the lead time and days of stock and click Save. 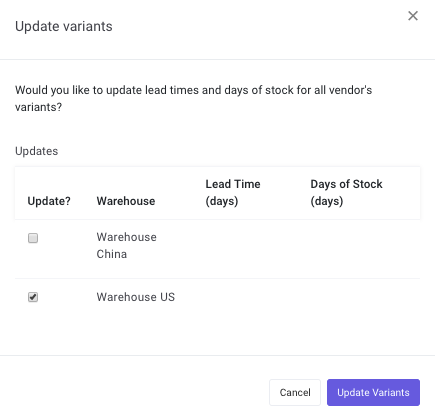 This option will allow you to set different lead times per location if you have multiple warehouses set up in your Inventory Planner account. You will then be prompted to update all variants associated with that vendor. Click the checkboxes under the 'Update?' heading, then click 'Update Variants'. Read more about how to associate variants with vendors. In the Replenishment screen (from left side menu), type updated information in the Lead Time and Days of Stock columns. Click on the field where you would like to update information and type in the new lead time or days of stock. Then Save Changes at the bottom of the page. In Replenishment, click on Import at the bottom of the screen. 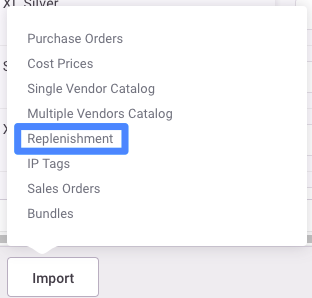 Select Replenishment from the import options. Attach a spreadsheet with one column for the SKU (or other unique identifier such as barcode or ID), one column for lead time and one column for days of stock. Be sure that each column has a column title. 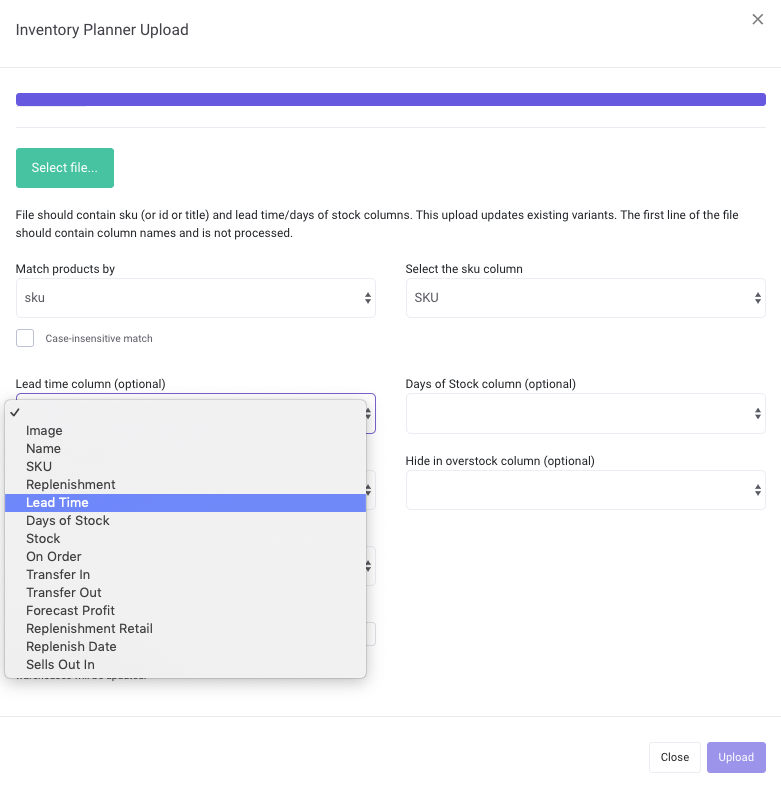 Match your column title to the corresponding field in Inventory Planner.